Novamid® ID 1030-CF10 by DSM is a polyamide 6/66 grade filled with 10% carbon-fiber. It is 3D printable at same speed as unreinforced plastics. It creates parts that are stronger, tougher and stiffer with high tensile strength and modulus. It offers very low warpage compared to unfilled polyamide (PA). It produces structural parts with high dimensional stability and durable parts with good mechanical properties due to high inter-layer strength. It shows a characteristic matte black surface-finish with less roughness. 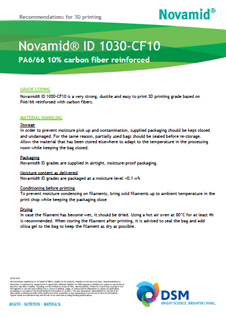 Novamid® ID 1030-CF10 is available in spools of 1.75 and 2.85 mm.